I was told this vase was for posies, maybe you know better? 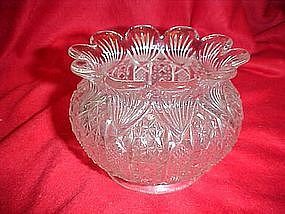 Measures 3" tall and has a nice repeating pres-cut pattern of pineapple with a fan top and alternating cross hatches, scalloped fluted top gives this piece a nice look. A faint distiction of lavender where it is starting to turn color. Perfect condition. Could possibly be a spooner maybe?? Lovely whatever it is!